With Javier Cercas, Christina Hesselholdt, Pajtim Statovci and Lina Wolff. European Writers 2019 and Norwich National Centre for Writing are delighted to welcome four of the most exciting writers from across the channel to Dragon Hall to share their stories and discuss the way literature can offer new and challenging views on identity, history and diversity, in response to the changes faced by Europe today. Chaired by Lucie Campos, Head of Book Department- Institut Français, London/ EUNIC London Vice President. 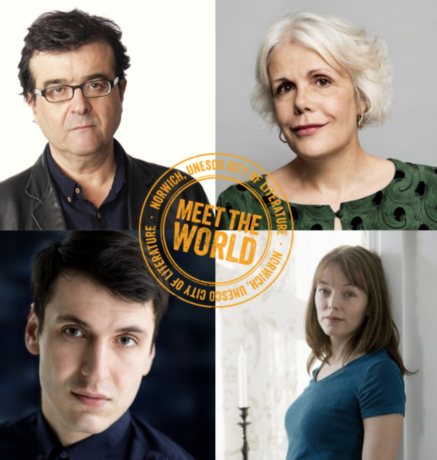 Presented in partnership withEUNIC London, the Norwich National Centre for Writing, Instituto Cervantes, the Embassy of Spain, the Finnish Institute London, the Embassy of Denmark, and the Embassy of Sweden.